The Bundle Ticket Printer is designed for use with all model XL200 Series Controllers as part of the XL200 System for roll formers. The XL200 Series Controller tracks the pieces being produced, stops at the end of a bundle, and prints a self-adhesive tag via the Bundle Ticket Printer. The operator removes the label from the industrial grade printer and applies it to the newly completed bundle. Bundle Tickets can be very useful for both in-plant and external uses. The tag identifies the contents of the bundle and can also include information such as routing directions or a customer’s address. Instructions such as job site placement can also be included. Weather resistant labels are available for bundles that will be exposed to the elements. Label formats come from one of two sources. 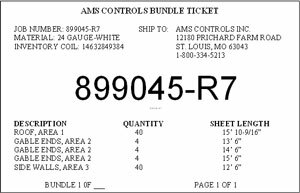 The XL200 Series Controller with the Bundle Ticket Printer option has a default format, which includes fields for Order Number, Bundle Number, Material, and Inventory Coil as well as a complete cut list. This format is not changeable by the user.